Good Morning! Jeff and I returned home yesterday from a five-day vacation in Mexico! One of Jeff's good buddies from high school, Robbie, was getting married on the beach, so, of course, we absolutely had to attend. While we were lounging at the pool, we sent Milton off to "camp," otherwise known as his usual, Downtown Dog. Upon arrival home, Milt Dog is utterly exhausted. Last night Jeff and I bathed and brushed to get him nice and clean again after all of his daycare fun. He was still a quite damp before bed, so we bundled him up to keep our little guy warm. 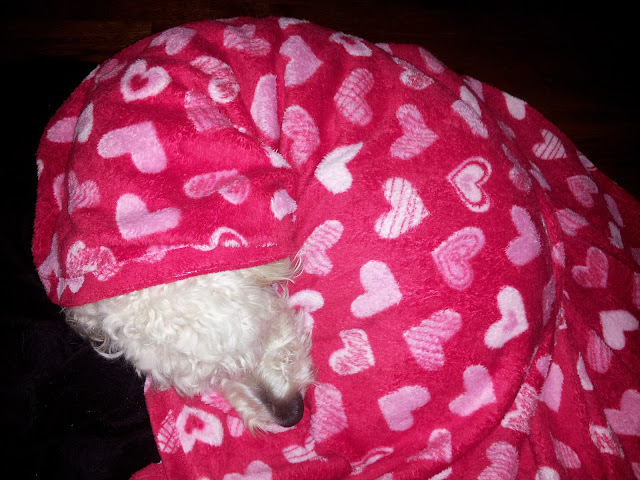 When we woke up this morning, Milt was still all wrapped up, so he obviously slept hard. We are happy to be back home with our boy. I will post more on Mexico later this week; Jeff and I had an absolute blast, but to quote myself, "Everything is better with cheese, on a boat, and with Milton." So glad to hear you guys had fun, can't wait to read all about it. I was on vacation myself, just shy of 2 weeks in North Carolina. Boy was it tough coming back to the "real world". Milt, even tired you're one handsome guy! Welcome back, Goob! I have never spent time in North Carolina; it sounds like you had an awful lot of fun, especially with a good buddy like yours. Take your time assimilating back into daily life -- it can be rough!